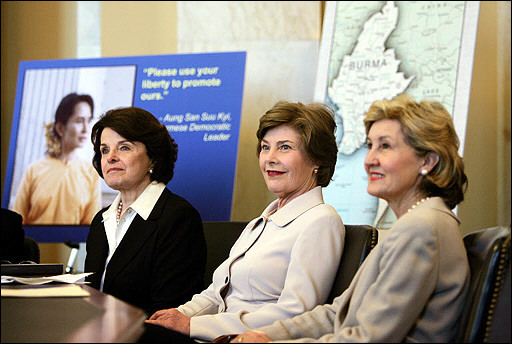 First Lady Laura Bush has asked for China to join the US in calling for human rights reform in Burma. The military junta that took power in the 90’s by coup is holding Aung San Suu Kyi and as many as 1,100 other advocates for freedom prisoner.Â Update: The EU has now also called for the release of Aung San Suu Kyi as the military junta is set to review status this weekend. Story at Yahoo. US First Lady Laura Bush on Wednesday called on China to join hands with Washington in efforts to restore human rights in military-ruled Myanmar. “Well, I think that China, especially, because of their closeness to Burma, should worry about the human rights abuses that are there,” the wife of President George W. Bush said at the lauching of the US Senate Women’s Caucus on Burma.Â Burma is the previous name of Myanmar, which has been ruled by the military since 1962. Last January, China joined Russia in vetoing a UN Security Council resolution urging Myanmar’s rulers to free all political detainees and end sexual violence by the military. She said China should be concerned about the drug trafficking and public health problems in Myanmar and their impact on the Southeast Asian state’s neighbours as well as the world in general. “So I think the people in the regime in Burma do know that their neighbors are losing patience. And I think that’s important for them to know, that the world is speaking together to them,” she said. The story doesn’t mention the large-scale polio outbreak in Burma aka Myanmar, and that refugees are starting to take it to other countries like Thailand and Pakistan, both nearby countriesÂ have stepped up vaccination programs in response.